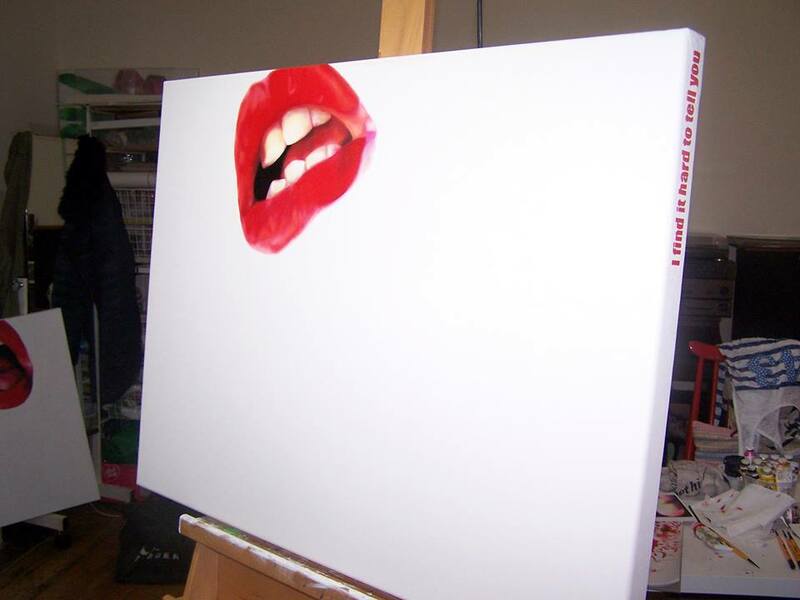 ORGAN THINGS: Snik and Meggs at Stolen Space gallery this week, more drops, a mouth and…. Monday, new week, new month, does East London First Thursday still exist? Did it melt away under the weight of property developers, Whitechapel Gallery (almost arrogantly) taking it all for granted? That and the lime poison that finally killed off things down one of the finest avenues of East London creativity. 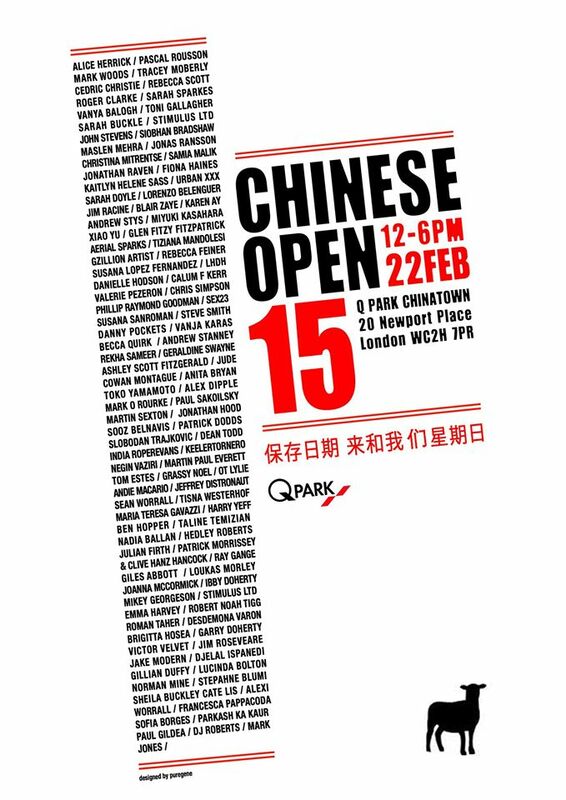 Things move on, right now we’re mostly looking forward to this year’s Chinese Open, meanwhile here’s a couple of interesting things happening at Stolen Space this (First) Thursday. Do rather like the Stolen Space mix of front room gallery formality and backroom texture, that and the back yard. You find Stolen Space Gallery at 17 Osborn Street, E1 6TD, down in Whitechapel, just around the corner from Whitechapel gallery actually. Stolen Space have two rather good looking shows opening this Thursday evening, Thursday February 5th, 6pm until 9pm MEGGS takes on one of the rooms, SNIK takes on the other, here come some words…. .
“From 6th February 2015, Stolen Space Gallery are proud to present the first UK solo show from art duo Snik, since their inaugural debut in 2011. Through an exhibition of new and classic works, Shadow Aspect explores the affects of light on a subject or moment through the medium of stencil and spray paint. 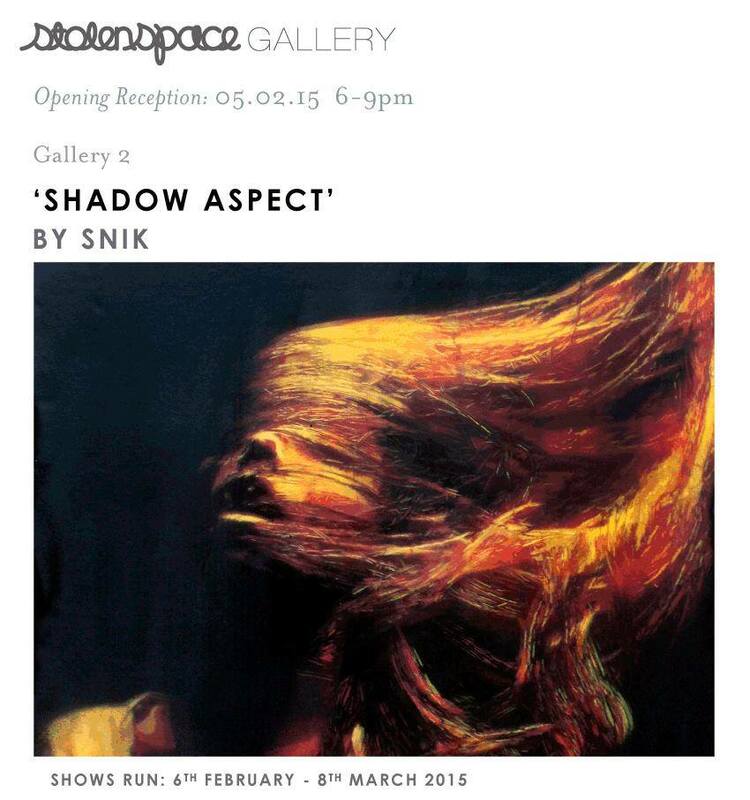 “Shadow has always played a pivotal role in Snik’s work. Drawing inspiration from theories of Impressionism and the dramatic lighting techniques of the Italian Renaissance, Snik present a reverse perspective to bring ‘light’ to the fore. By directing our attention away from the impact of the stark vacant spaces, light illuminates the more delicate details of their intricate cuts; the tangled strands of hair, the folds and textures of the fabrics. Pushing the boundaries of medium and tools; Snik encourage us to question the value of art and the progressive techniques which continue to move it forward. The exhibition will feature a number of unseen originals all on cardboard, as well as a few classic pieces showcased with their original stencils”. The #365ArtDrops went on this weekend, we’re rather enjoying the shots posted by people who have found some of the thirty-one pieces that have gone out so far… the link you just passed tells you more, the drops go on this week…. “StolenSpace Gallery presents ‘Rise & Fall’ a satirical solo exhibition by Los Angeles-based artist MEGGS. Following his residency and sold-out show at Inner State Gallery in Detroit last September, where he painted his largest mural to date at over 6,000 square feet, MEGGS continues his perpetual fascination with dualism, urban decay, and finding beauty in tragedy. ‘Rise & Fall’ toys with current fractures in the social fabric of urban society, such as imploding over-indulgence, fallen idols, and the detriments of pop culture. 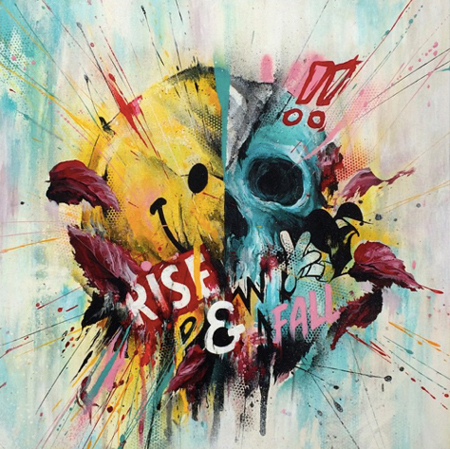 In ‘Rise & Fall’ MEGGS combines light and colorful imagery with his unique, expressive, and energetic style. His technical use of color and movement fuse clean, bold, illustrative elements with intuitive, textural, and free flowing design. The exhibition will feature comic influences, natural elements, pop icon mash-ups, and abstract collaging on canvas, paper, wood panels, and comic book covers. Originally from Melbourne, MEGGS has proven to be one of Australia’s most progressive street and fine artists with countless murals and gallery shows worldwide. 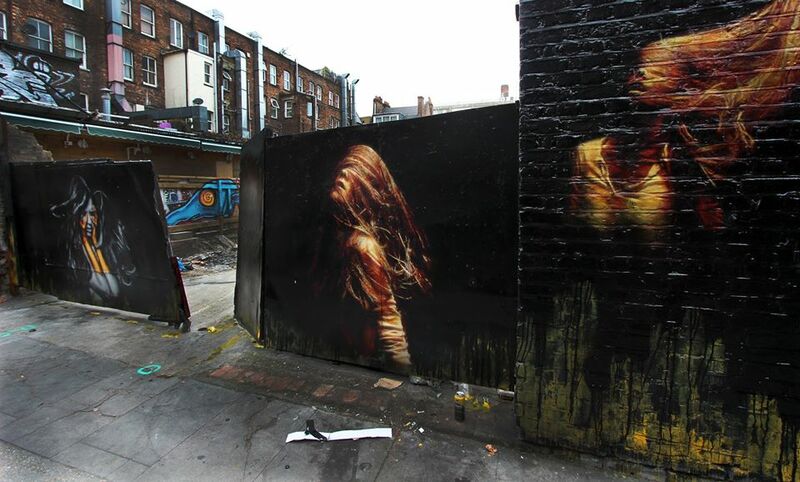 His massive, large-scale murals throughout the globe have made him a must-see artist at mural festivals like POW! WOW!, Forest For The Trees, and Pangeaseed’s Sea Walls. Taking this same tireless work ethic to fine art gallery shows with creative and immersive installations, MEGGS’ ‘Rise & Fall’ will be sure to impress”. What’s EMMA HARVEY doing? I find it hard to tell you..